Upon first hearing the announcement that Joel and Ethan Coen were doing a remake of the John Wayne classic True Grit, I was wary. Not only does Hollywood need another remake like a hole in the head, but one was perplexed at why the Coens of all people had succumbed to the recent trend of remaking any property that has made a splash within the last half century. (And no, I wasn't even thinking about their ill-fated update of the classic British black comedy The Ladykillers.) However, my fear had turned into desire upon seeing an early trailer for this new film, which showcased its darker and moodier moments. And upon finally viewing this movie after all its acclaim, one must say: believe the hype- it's real, for once. For this 2010 "reboot" of this piece of American pop culture, in which John Wayne won his only Oscar for his role as the one-eyed rascally marshall Rooster Cogburn, the Coens wisely sidestep all of the iconography surrounding the 1969 movie, and instead return to the source (Charles Portis' novel) which had inspired that film. I seem to recall picking up Portis' book in my teens (during my western paperback craze), and not finishing it because the novel was less action-oriented than the Hollywood movie, more humanistic and poetic. As a result, the Coens' have written and directed a film that is truer to the essence of the novel than the John Wayne movie. Those looking for a slam-bang action western (along the lines of, say, the recent remake of 3:10 To Yuma) will be disappointed. 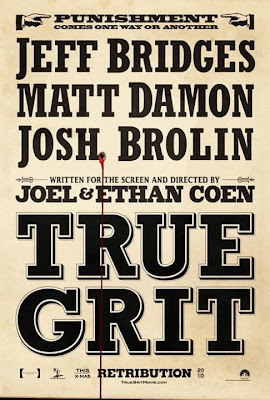 Instead this version of True Grit is a refreshingly low-key, meditative tonal poem on mortality and memory, seen through the eyes of 14-year-old Mattie Ross, who hires US marshall Rooster Cogburn to go after desperado Tom Chaney, who killed her father. This movie is also remarkable for its realistic depiction of frontier life, captured in earth tones by cinematographer Roger Deakins. Many characters within are with dirty clothes and bad teeth, and just a little mad. Like the 1972 western Bad Company (also starring Jeff Bridges, and perhaps may have inspired this film- who knows? ), one would have to be slightly tetched in the head to want to live here. For a change, the Coens downplay the characters' eccentricities (the brothers are always better when they're subtle) and even the guy making animal noises seems authentic. Refreshingly, the Coens present a naturalistic view of frontier life without being as quirky as Philip Kaufman's The Great Northfield Minnesota Raid. What can I say? I absolutely loved this movie- it is the Coens' best film in years: I certainly prefer it to their overpraised No Country For Old Men and A Simple Man.